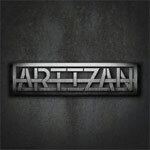 Artizan, a progressive metal band from Jacksonville, is the creation of two former members of Century Media recording artist Leviathan, Tom Braden (v) and Ty Tammeus (d). In the mid 1990's, they had two successful and well-received albums on the label. Braden and Tammeus are working their way back into the metal fold with the help of guitarists Shamus McConney and Hermanus Rombouts and bass player Jon Jennings. For some serious street cred, Artizan enlisted Jim Morris (Iced earth, Death, Cannibal Corpse, Crimson Glory, etc.) to handle the production for a crisp sound. Though brief, Artizan's debut EP is substantial evidence that this band is onto something very good. The work is blessed by well-crafted compositions which blend melodic hooks with developed, but not overbearingly complex, progressive arrangements. Each of the three songs quickly piques your interest and pulls you in. Braden's vocals may be the highlight here as he soars with a strength uncommon in most modern metal vocals. Equally impressive is the vigorous fret work which, at times, mimics old school classic metal yet with renewed energy and passion. This is solid stuff: an easy and entertaining listen for all melodic metal fans, yet with enough twists to keep prog fans happy. Any label worth its melodic heavy metal salt should hook up with Artizan at the first opportunity. Are you listening, Century Media? Artizan's debut EP is solid stuff: an easy and entertaining listen for all melodic metal fans, yet with enough twists to keep prog fans happy.